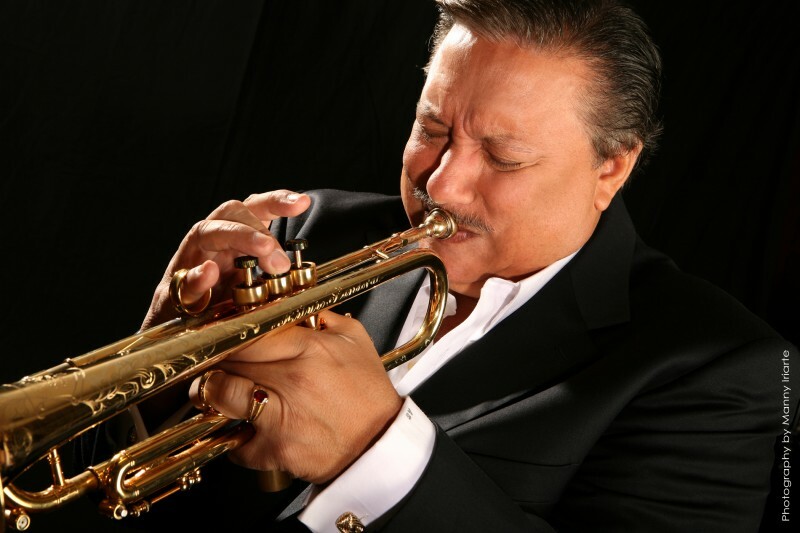 St. Cecilia Music Center features Arturo Sandoval in concert this Thursday, October 11th. Sandoval is a protégé of the legendary jazz master Dizzy Gillespie and one of the most dynamic and vivacious live performers of our time, seen by millions at the Oscars, Grammy Awards, and Billboard Awards. Concert tickets for Arturo Sandoval are $45 and $50 and can be purchased by calling St. Cecilia Music Center at 616-459-2224 or visiting the box office at 24 Ransom Ave. NE. Tickets can also be purchased online at www.scmc-online.org. A pre-concert reception with wine / hors d'oeuvresis available by reservation for $15 and begins at 6:30 pm. A post-concert party with dessert, coffee and wine is open to all ticket-holders and Arturo Sandoval’s music will be available after the concert. St. Cecilia Music Center (SCMC) in Grand Rapids will launch their Jazz Series this Thursday, October 11, 2018 with 10-time GRAMMY™ Award Winner Jazz Trumpeter Arturo Sandoval. Arturo Sandoval, protégé of the legendary jazz master Dizzy Gillespie, is one of the most dynamic and vivacious live performers of our time, and has been seen by millions at the Oscars, Grammy Awards, and Billboard Awards. Concert tickets for Arturo Sandoval are $45 and $50 and can be purchased by calling St. Cecilia Music Center at 616-459-2224 or visiting the box office at 24 Ransom Ave. NE. Tickets can also be purchased online at www.scmc-online.org. A pre-concert reception with wine / hors d'oeuvresis available by reservation for $15 and begins at 6:30 p.m. A post-concert party with dessert, coffee and wine is open to all ticket-holders and Arturo Sandoval’s music will be available after the concert. A protégé of the legendary jazz master Dizzy Gillespie, Arturo Sandoval was born in Artemisa, a small town in the outskirts of Havana, Cuba, on November 6, 1949, just two years after Gillespie became the first musician to bring Latin influences into American Jazz. Sandoval began studying classical trumpet at the age of twelve, but it didn’t take him long to catch the excitement of the jazz world. While still in Cuba, he was influenced by jazz musicians Charlie Parker, Clifford Brown, and Dizzy Gillespie. He finally met Dizzy Gillespie in 1977. Gillespie became a mentor and colleague, playing with Sandoval in concerts in Europe and Cuba and later featuring him in the United Nations Orchestra. Sandoval defected while touring with Gillespie in 1990, and he became a naturalized United States citizen in 1998. Arturo Sandoval’s life was the subject of the film For Love or Country: The Arturo Sandoval Story (2000), starring Andy García. Arturo Sandoval has won ten Grammy Awards and has been nominated nineteen times; he has also received six Billboard Awards and one Emmy Award. Throughout his life experiences, Arturo Sandoval has evolved into one of the world’s most acknowledged guardians of jazz trumpet and flugelhorn, as well as a renowned classical artist, pianist and composer, performing regularly with the leading symphony orchestras from around the world. Arturo Sandoval reaches beyond the scope of mere effort. His struggles while in Cuba and since his defection have given him more energy and strength, urging him to accomplish and surpass his childhood dreams. Filled with a virtuoso capability, he desires nothing more than to share his gift with others who feel the same intense adoration for music as he does. He is one of the most brilliant, multifaceted and renowned musicians of our time. More about Arturo Sandoval can be found on his website at arturosandoval.com. The Kenny Barron Quintet performing on November 1, 2018. Barron has earned eleven GRAMMY™ nods beginning in 1992 for Best Jazz Album with “People Time” an outstanding duet with Stan Getz, and most recently in 2017 for Best Jazz Instrumental Album. TheLos Angeles Timeshas called Kenny Barron "one of the top jazz pianists in the world” and he was named Best Pianist in 2017 by the Jazz Journalists Association for a record seven times. SCMC’s 135 Year Anniversary season will include the Chamber Music Society of Lincoln Center performing three concerts. Beginning on November 15, 2018, CMS of Lincoln Center will perform the beloved Schubert composition “The Trout Quintet”, as well as,diverse gems from the 19th century including works by Beethoven and Bottesini. March 14, 2019, CMS will return to perform a program entitled Russian Mastery, featuring works by Rachmaninov, Tchaikovsky, Prokofiev and Arensky.They will perform again on April 25, 2018 with a program titled From Mendelssohn, celebrating the German romantic composer Felix Mendelssohnwho led prominent composers (Schumann, Brahms, Tchaikovsky and others) to follow him for generations. The Acoustic Café Folk Series began on October 4, 2018 with St. Louis-based singer, songwriter, and multi-instrumentalist Pokey LaFarge in his first solo concert since 2006; The Lone Bellow will perform on November 29, 2018, and is a Brooklyn-based band (now in Nashville) who have become known for their transcendent harmonies, serious musicianship and lively performances; “The king and queen of the banjo”,Béla Fleck & Abigail Washburn will return to SCMC on February 9, 2019; and two-time Grammy nominees and winners of The Best Duo Group of the Year by American Music Group Association, the California based Milk Carton Kids will perform on February 28, 2019.